My profession as a fashion stylist requires me to style a character as real as possible. Be it a watchman, officer, king, African men, or Indian women, it’s about getting into the skin to make it look real on celluloid. One such assignment got me to do an intensive research on recreating the Parsi women on screen. 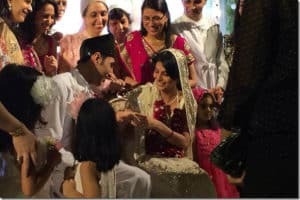 The calm and modern Parsi community has its roots firmly established in India since the time their ancestors fled Persia in quest of peace. The majority of Parsis are found in Gujarat and Mumbai region though they are spread across the country. As a resident of Mumbai, I believe this city would have been dull and boring without the support of the Parsi community. Be it business, food, travel, philanthropy, heritage, or entertainment, Parsis have played a major part in shaping the city to what it is today. The first thing that sets a community apart from the crowd is their clothing and it obviously captured my eyes instantly. Be it the Parsi gara embroidery or the Parsi paghadis, it sets an individual identity on its own. 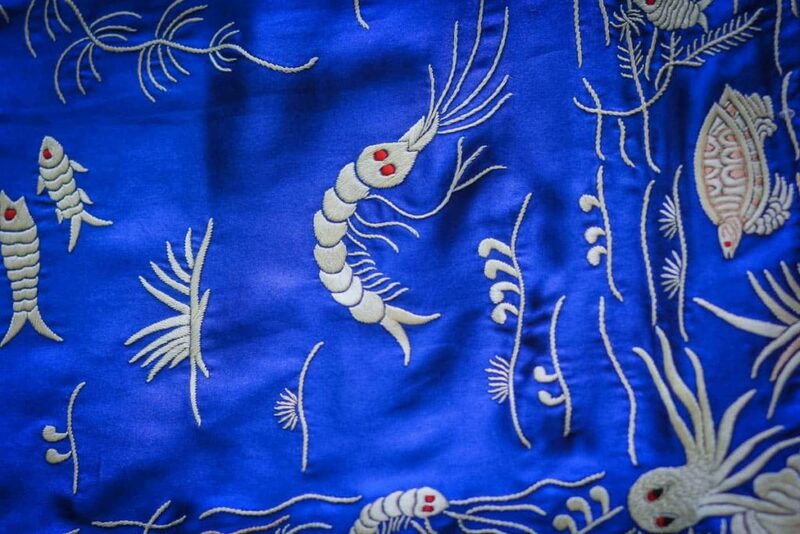 The beautiful Parsi gara embroidery is not only a breath-taking visual delight, but is also a dying art. It’s hard to find an original parsi gara embroidery these days. Through my research I met Zenobia Davar in Mumbai who has been practising the art of gara embroidery since a long time now. Tracing back to history, it is said that the Indian Parsi men started trading with China when they found the gara (Chinese fabric) in hand spun pure silk. Since then this art has been preserved by the Parsi community. Although to be specific, very few authentic garas are left now. Zenobia is happy to take me through her entire collection of Parsi gara embroidery including saris, embroidered borders called “kor”, wall frames, topis for men, frocks for kids, blouses and tops. The process is tiresome and extremely long as compared to other art forms. 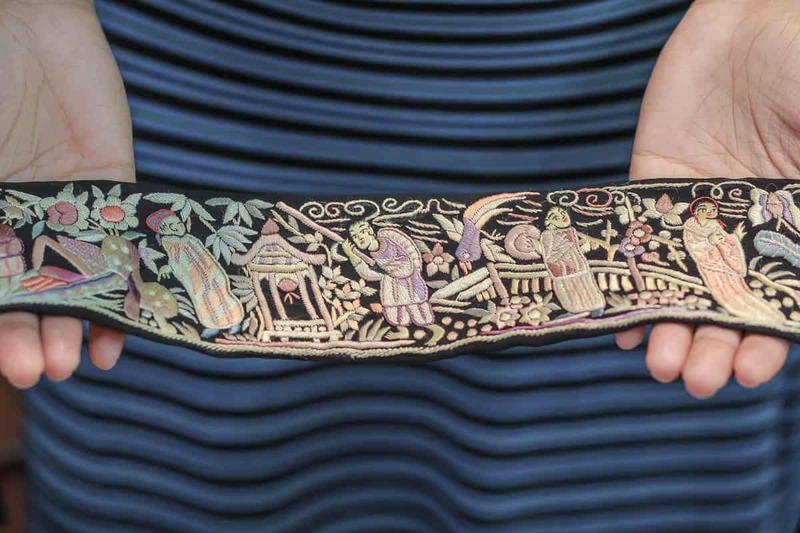 This art uses a straight needle as compared to a needle with a hook used by other embroideries in India. Pure silk skeins from China are used in the embroidery which ranges from satin stitch, French knots, stem stitch, petit point, forbidden stitch, or straight stitch. Pure fabric is required as a base as the synthetic fabrics tend to pucker once the embroidery is done over it. Fabrics like shammo satin, crepe, jacquard crepe, georgette, chiffon, organza, and silk are generally preferred. Zenobia shows me the different fabrics and stitch combinations. 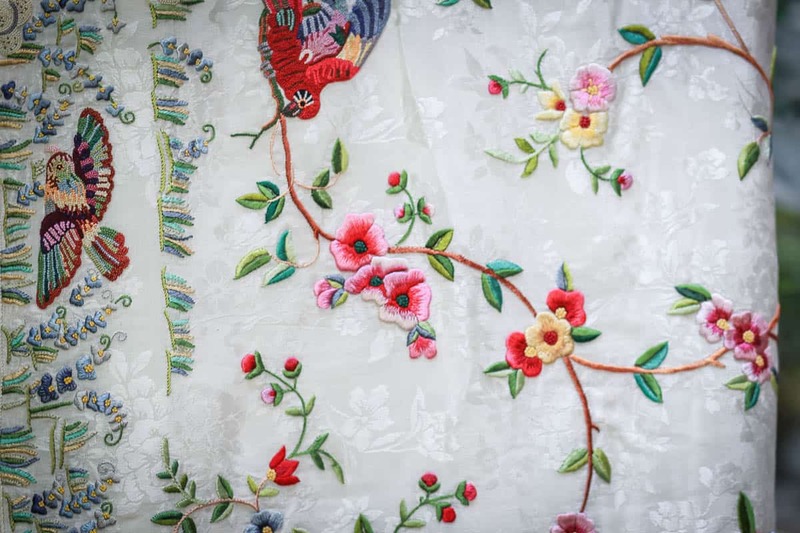 Motifs are generally inspired by nature like birds, trees, flowers, bees or a variety of Chinese motifs like pagodas, Chinese figures and writings. At a glance all the stitches look the same to me, but on a deeper look I find the intricacy of the stitches not only beautiful but also having a different character altogether. The petit point stitch is a cross stitch without the cross. It is a single stitch which crosses the warp and the weft of the fabric either horizontally or vertically, but strictly in one direction. The forbidden stitch or the kha-kha stitch is a French knot with a comma by its side. The most amazing feature of this embroidery is that it looks the same on the reverse side too. Knots of the stitches are hardly seen and the finish on the back is identical to its front side. The embroidery style that they follow is either border and palla or akho garo (full embroidered sari). The embroideries are offset by using a contrasting colour fabric as the base colour so that it stands out to the maximum. 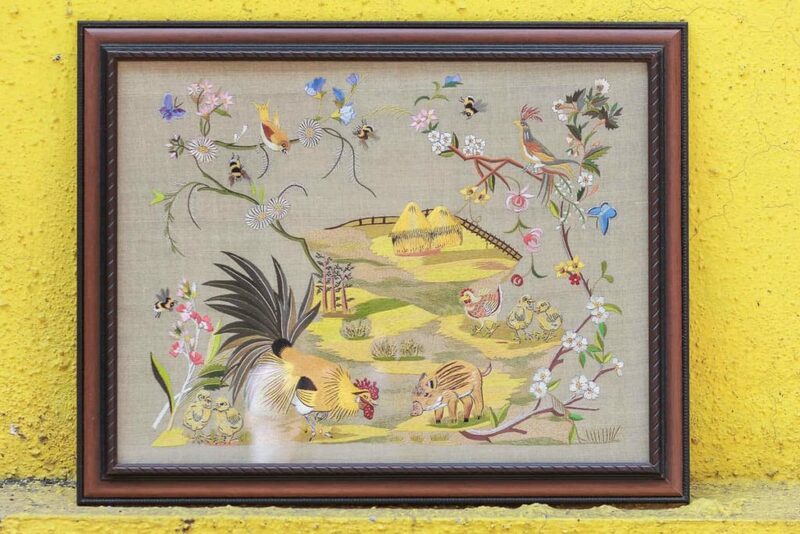 Each masterpiece takes anywhere between two to eight months to complete depending on the amount of embroidery involved. The karigars (craftspersons) are given an easy and a hard motif alternately to relax their eyes. As a styling input, I found that these saris are worn with either the same colour plain blouse or a same embroidered blouse to match with the sari. Minimal jewellery is worn with the gara as it is visually very graphic to imbibe more elements. A similar colored underskirt (petticoat) is worn under the draped garment. Traditionally, I have seen a lot of Parsi women wear the sari with loose shirt like blouses too. Women would take the palla over their head and expose only one ear with a chandelier earring. 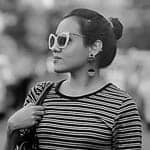 Thus the trend of single chandelier earring started. But now women drape these saris in different ways. This sari is easy on maintenance as it can be worn several times before dry cleaning. It can be preserved in simple cotton cloth bag for years to come. Truly, it‘s a feast for the eyes and fit for a queen! The dapper Parsi men compete with their female counterparts. Although they don’t wear much of embroidery, they take full pride in flaunting their parsi paghadis (turbans). Iconic JRD Tata (chairman of the Tata group, founded by a Parsi family) wore his paghadi constantly as a sense of pride and identity. But it is surprising today that this Parsi art is on the verge of extinction, with only one person preserving this art in today’s times. Gulshan Kolah from Mumbai is the only paghadi maker for the Parsi community today. An urge to dress her husband in the paghadi during her own wedding had prompted her to learn this art from Mr. Nariman Pagdiwalla and soon she began to take up this art as a profession. Gulshan takes us through the process of making a paghadi which takes around 15 days to be completed. One metre of fabrics like cotton, silk or gajji silk (mashru) is used to make a paghadi. 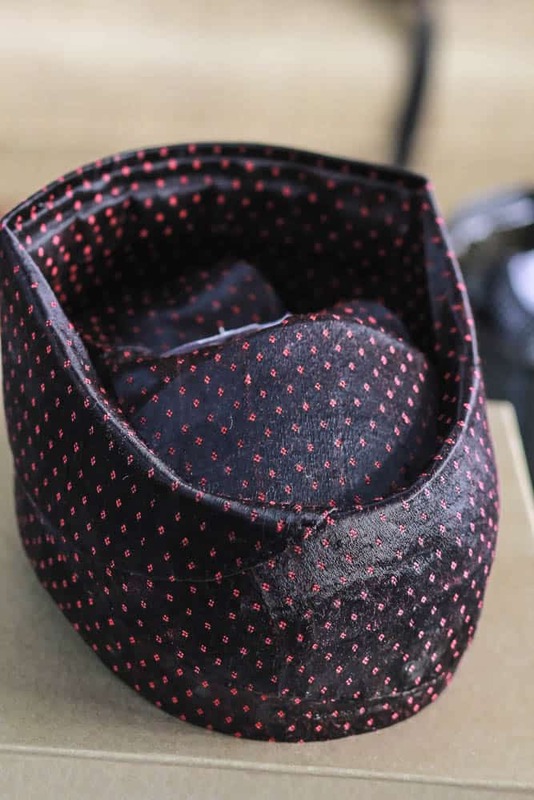 Traditionally the colors are generally black or black with tiny gold and red dots, but these days grooms prefer to wear colours like maroon and navy depending on one’s preference. The process of making a paghadi is labour intensive. 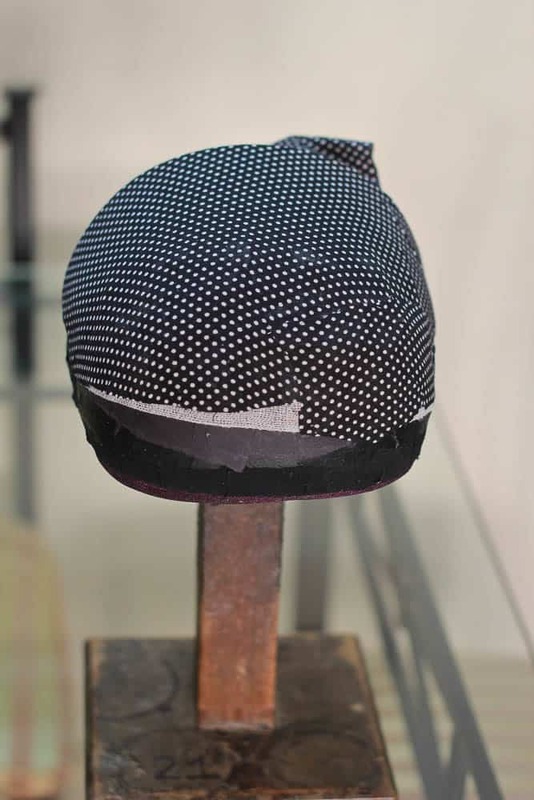 A wooden mould is prepared according to the head round measurement and then the fabric is cut and pasted onto the mould. Each piece is allowed to dry completely before sticking another piece so that it can be preserved for a long time. Cardboard is used to give it a stiff shape and satin fabric is used as lining. These days, paghadis are about five to seven inches in height as compared to their long ancient versions. Gulshan says that the paghadi is full-covered or semi covered-based upon individual preferences. I love the way Parsi men style themselves at their wedding. They wear a traditional dughli (overcoat) with pants and carry a white shawl on their arms. This whole look is offset by a dark colored stiff paghadi. Sometimes a paghadi is also lacquered to give it an extra sheen. 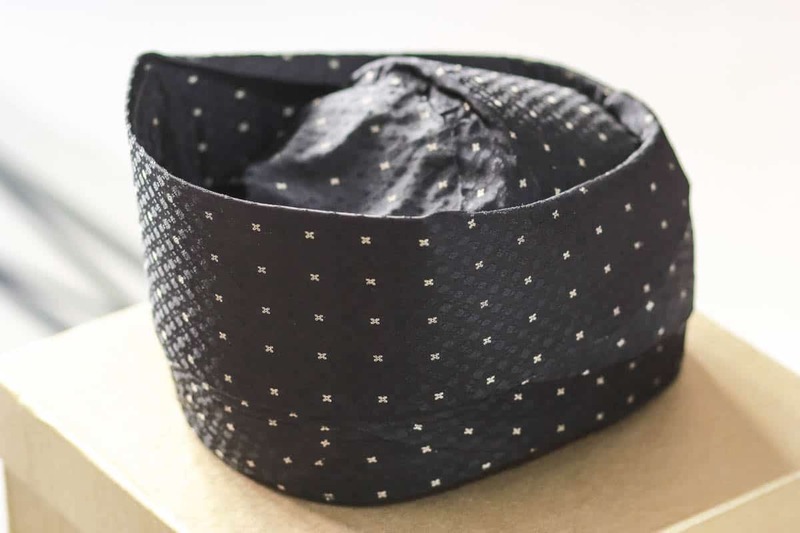 It’s also worn by boys after their navjyot ceremony (initiation into Zoroastrianism). Gulshan says that a paghadi is fit to one size, hence it cannot be altered or used by two people. 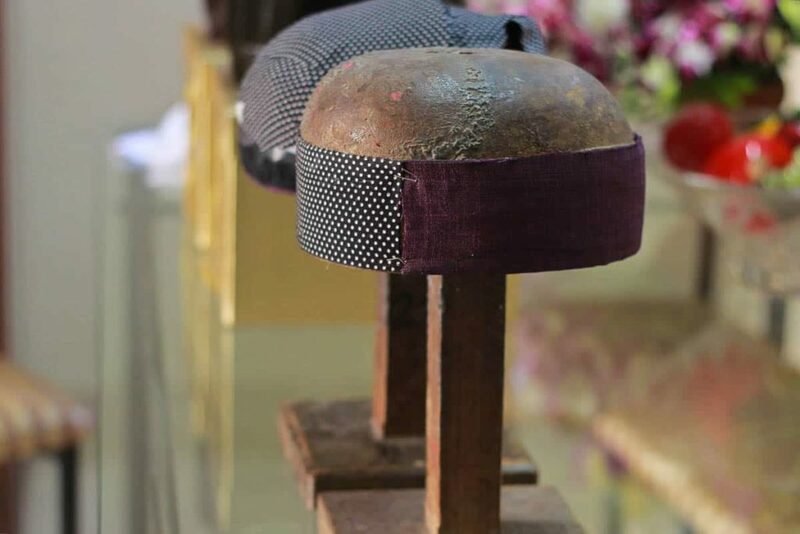 Every Parsi has a paghadi made for him and it is preserved for years to come until their head measurement changes. Their look is simple yet elegant with no jewellery as compared to other communities in India. It is clearly evident that the Parsi arts and crafts have a strong Chinese influence, be it the garas or the paghadis. 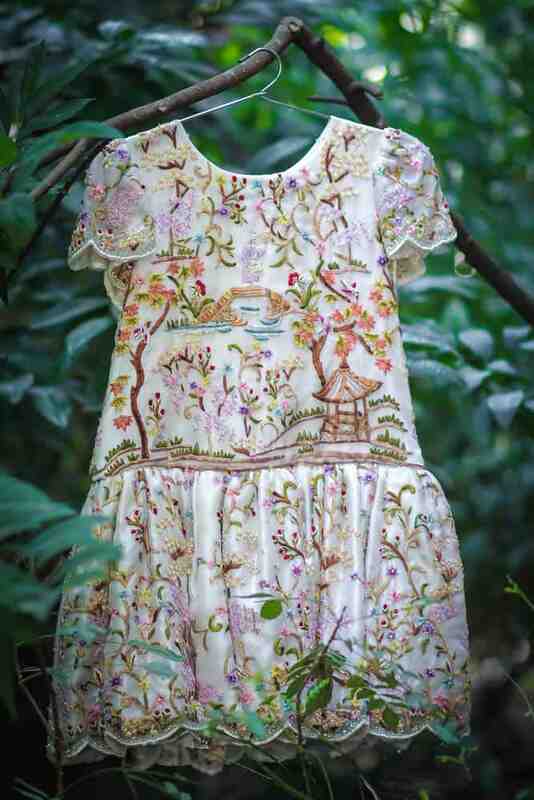 It seems like an amalgamation of Chinese motifs with Indian silhouettes and fabrics. The subtle design sensibility is mixed with sheer precision and supreme finish. It is astonishing to see such art being preserved in a hustling city like Mumbai, always pressed for time. But it is this never-say-die spirit of the city that allows each and every community to be self expressive in all possible ways and preserve their cultural integrity. Kudos to the spirit of this community and to the Maximum city!! This is a well researched and well-written article. I particularly liked the fact that after starting with the history of the Parsi community, this article took me through all the different aspects of Parsi couture. 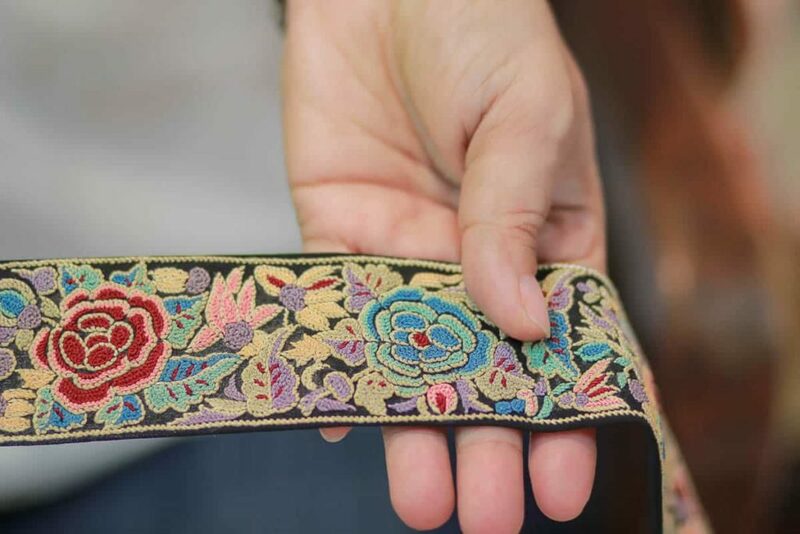 Be it the gara embroidery, the different types of stitches or the making of a paghadi, everything is adequately detailed. The beauty of the article lies in the fact that it instigates even a random reader to appreciate the Parsi arts and crafts. Keep up the good work!!! Real proud to see the Parsi culture described so accurately. Many thanks.